Reduce energy use up to 90% with the VS FloPro’s high-efficiency variable-speed motor. This high performance, energy-efficient, variable-speed pump is an easy-to-install, retrofit solution and can deliver up to 90% reduction in electric costs. Digital controller included (2 timed speeds/8 speeds). Adjustable base options available, which allow for direct replacement of leading Hayward®, Pentair®, Sta-Rite®, and Jandy pumps. Interfaces with iAquaLink™, AquaLink® Touch™, AquaLink RS OneTouch™, PDA Systems, and the JEP-R Pump Controller. Complies with Appliance Efficiency Standards (Title 20) and qualifies for energy company rebates where available. 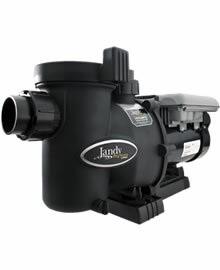 Compact, High performance pump in an ultra compact body. Ideal for small equipment areas. Constructed of corrosion resistant materials for optimal performance and longevity. Quiet, Controlled flow dynamics for ultra-quiet operation.